The light trails or traffic trails photograph was taken from the rooftop of the Ocean Terminal in Tsim Sha Tsui, Kowloon, Hong Kong. It is one of the common and popular photography locations in TST among both amateur and professional photographers. 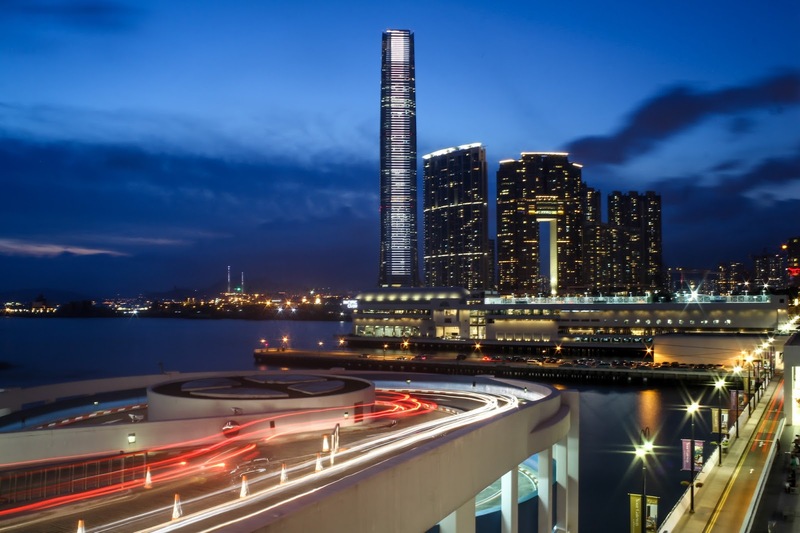 The front view of the cylindrical shape tower is the way of the Ocean Terminal Rooftop Car Park, where you can see the light trails. The far away tower is called ICC tower, which is the tallest tower in Hong Kong. And the right side of the towers and the area is called Union Square. If you are a tourist or a recently moved to Hong Kong, you probably love to see the view from the Ocean Terminal rooftop. If you are a photographer, the location will be one of your most remarkable spots in Hong Kong. It's easy to access to the spot if you are local guy or familiar the Tsim Sha Tsui area. From Tsim Sha Tsui Clock Tower or Star Ferry Pier, you can see Ocean Terminal Plaza and take the escalator to the rooftop. It's more easier if you drive directly to the Ocean Terminal Rooftop, which is the car park building. Moreover, If you visit in the evening in a clear sky day, you can take breathtaking sunset photography from the location. Also it is a better place to take night photography over the Victoria harbour. We hope you will enjoy the visit. If you have any question about the location or more details, please feel free to contact us using the comment box below. Thanks!